With the clackety-clack of local trains roaring by every few minutes, lessons at the Chembur Station Municipal School need to be loud and clear, especially during the monsoon when this is accompanied by the pitter patter of intermittent downpours. This is one of many municipal schools located near railway tracks, over bridges and other sources of regular noise that take visitors by surprise. By the end of the day, however, one gets used to it as part of the background. This is daily life in this neighborhood. Mery Periera, Field Coordinator for Western suburbs leads a discussion on learning that is gained through life experience and not based in books. Like the city, the students get on with it, supported by a dedicated body of teachers. Peak monsoons did not stand in the way of teacher training workshops, which AID partner Avehi-Abacus conducted for 1300 standard V teachers of 862 Mumbai Municipal Corporation (BMC) schools over 2 weeks in July. 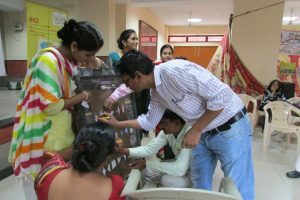 I observed the training for teachers in the M Ward. As I walked in the teachers were in the middle of the room moving about silently, in no pattern that I could discern. It turned out that they were each part of a triangle that they were trying to maintain, while other members of their triangle were part of other triangles, that they were simultaneously trying to maintain. They discussed the dynamics of their efforts and compared these to their work as teachers and in life. Through a variety of such exercises teachers introspected about their role in the learning journeys of their students and communities, discussed the challenges their students faced, as well as the knowledge and skills they brought with them from their own family backgrounds and work experience. Some, for example, helped their parents sell vegetables, repair appliances or take care of household chores. Most students attending the BMC schools come from families living below the poverty line. 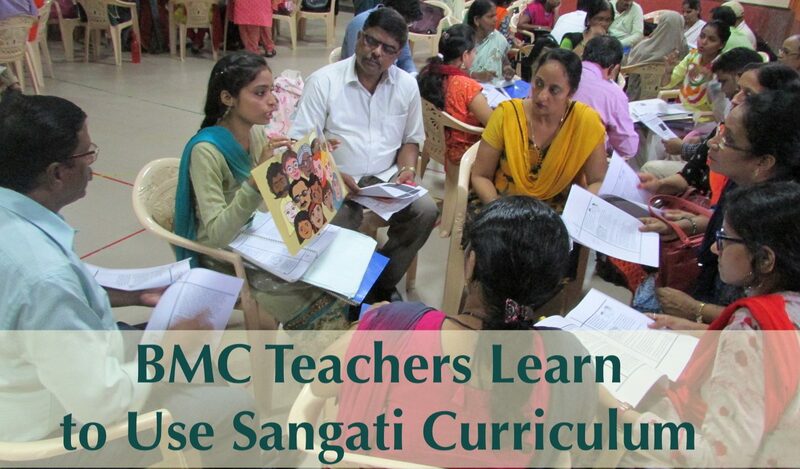 The Sangati curriculum that Avehi-Abacus has developed for children of age 11-15 and the BMC has adopted for classes 5-7 integrates social studies and sciences and encourages students to think about themselves and their families in relation to social issues. Avehi-Abacus has also developed a pre-service teacher education module called Manthan which covers two of the three curricular areas prescribed by the National Council of Teacher Education. 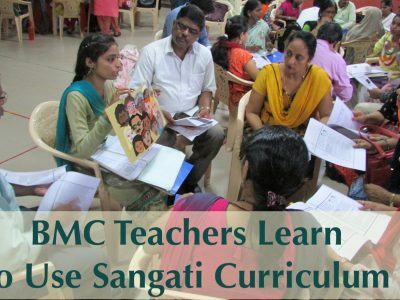 The Sangati curriculum is more than a collection of lessons for teachers to impart. It comes with a philosophy of teaching and learning, encouraging students to express their ideas without worry over grades and empowers teachers to listen to students and recognize the diverse ways that children – and all of us – learn. As part of the Avehi Abacus training int he Sangati curriculum, BMC teachers engage in an exercise that prompts introspection on teaching and learning. Explaining the principles behind the Sangati curriculum were Simantini Dhuru, director of Avehi Abacus, Vaishali Nwate, field coordinator for Central and Eastern zone schools, Mery Pereira, field coordinator for the western suburbs, Manisha Jain field coordinator for South Mumbai, Dinesh Chavhan, field coordinator for Manthan, Vaneeta Darade and Shaheera Ansari, field representative for Govandi. After some activities promoting introspection on teaching and learning and presentations on Sangati, the teachers then broke out into small groups to practice lessons from different parts of the curriculum. After reassembling, they took turns teaching these to the entire group. Teachers in small groups discuss lessons that are part of the Sangati curriculum in social studies, developed by Avehi Abacus for BMC schools. 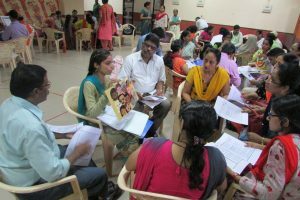 The teachers took keen interest in the exercises and shared insights from their experience in the classroom with great conviction. Their talent and dedication to their calling make them a treasure in the community. I left with a sense of awe at the potential of the municipal school system. And in equal measure, a sense of puzzlement at the declining rates of enrollment. One piece of this puzzle becomes clear if we follow the money. 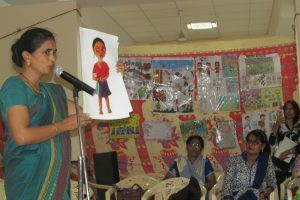 Commenting on the 2018-19 budget on behalf of the Jagnyachya Hakkche Andolan (a state-level network of people’s organisations and workers unions), Simantini Dhuru reveals the distribution of resources to public and private schools at state level. “Out of the total allocations to Secondary schools, the combined share of Government and Zilla Parishads is mere 4.03% and the non-government schools get a whopping 95.96%.” The JHA has called for budgetary provisions totalling Rs 14,699 crore for providing education on par with the Kendriya Vidyalayas and to bring 20 lakh out-of-school children into state schools. 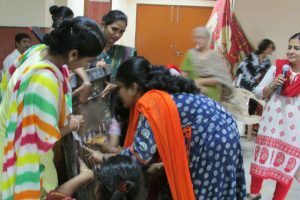 AID supports the teacher training program of Avehi Abacus.